I want to tell you that we always have time for a complete breakfast around here. I want you to believe I get up and cook a hot breakfast in the cold of winter each morning before I lovingly send my family out into the world. I also want a pony, but that's probably not going to happen, so you can imagine that my previous 2 statements may be a bit lacking in truthiness. The fact is, I have 2 teenagers with variable eating habits, and an 8 year old that is like me, and really doesn't get hungry until the middle of the morning. Combine that with us all needing to leave the house by 7am for three different places each weekday and a busy sports schedule on the weekends, some mornings we're lucky to have clothes on by the time we hit the door, much less a complete, sit-down breakfast. The kids scoop them up and run when we're late, or have to be somewhere at the crack of dawn. I think Busy Dad even keeps a box of them in his car. They're also often my youngest kid's morning snack at school since he may or may not have eaten the breakfast he was served at home. What's your go-to breakfast when you're in a hurry at home? To enter, leave a comment below and tell us about your favorite go-to breakfast when you're in a hurry. Contest ends 5pm PST September 6, 2010. I grab a protein bar! My in-a-hurry breakfast is either just a bottle of milk (hey, it's a LITTLE healthy), or a baggie of dry cereal. It's come to the point that I actually prefer dry cereal to cereal with milk, I'm so used to it. Any kind of granola bar that I can easily eat in the car is my in-a-hurry breakfast. Daughter always has a smoothie make on Sunday and put in five different cups, grab and go. I love to have a rice cake with peanut butter and bananas on top. It can be eaten on the run! I have gluten issues so this is great for me. The kids have even taken a waffle with peanutbutter, fold it and they are on the run...I just make sure they have a glass of milk for protein to slam before they head out! Bagels with peanut butter and sliced bananas. Granola bars are almost all I ever eat for breakfast- I never leave as much time as I should to put something together! Poptart, banana, or granola bar. Sometimes I freeze the leftover pancakes from the weekend. Then I can just pop it in the microwave or toaster and I'm good to go! I like cereal when I'm in a hurry...no cooking time! I'll grab a breakfast bar, fruit, leftovers in the fridge or a frozen waffle. When I'm in a big hurry, I go for a granola bar. Berry smoothie when we’re in a hurry and a piece of toast works really well! my favorite go-to breakfast when you're in a hurry is bananas, it's fast to eat and keeps me full. My go-to breakfast is a healthy protein shake. Very easy to make. My favorite breakfast in a rush is a few bananas! I make what we call egg o' muffin sandwiches and bag them for the freezer on the weekend. Then my 15 yo who is always running late can grab and heat. When I’m in a rush, I grab a yogurt that I can eat at my desk in the morning, and I always have a can of cashews or almonds in my drawer. I grab a granola bar and some fruit or yogurt. My favorite breakfast when I'm in a hurry are some nice hot poptarts wrapped in a papertowel. I love my pop-tarts hot. My fav are Cherry. I just take em and go! We all like cold cereal so we keep a variety on hand. This is our fav go to breakfast when we are in a hurry. Each can choose which they want. My go to breakfast is cereal bar, breakfast shake, or fruit smoothie. Thanks! I go for a granola bar and banana. Thanks! Yogurt and a banana is my go-to quick breakfast. 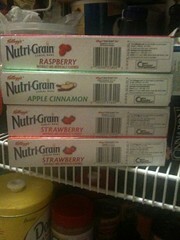 I love Nutrigrain bars. Haven't had them in a while so thanks for the reminder! Toasted waffles with pb&j. I make our own jam, so it has less sugar (and sort of counts as a fruit, right?) and of course natural peanut butter has lots of protein and some fat to help ward off the hungries. The waffle is just a neat package. I like to eat a Clif bar for breakfast when I'm in a hurry. I love yogurt and a granola bar when I am in a hurry. OK...coffee. :-) My little boy loves those pancake/sausage on a stick. They look perfectly horrible to me, but they are easy to bring along in the car! If I have bananas, those are the easiest to grab. Pop Tarts or granola bars are next. Then maybe prepackaged peanut butter and crackers. I grab granola bars when I’m in a hurry. I grab a few crackers and fruit I can eat easily in the car! My go-to breakfast when we are in a hurry is toast with either peanut butter or butter, cinnamon, and sugar. There are some mornings when even cereal takes too much time for us. I feel like the world's worst mommy on those mornings and make my daughter take a cereal bar or donut so I know she at least ate SOMETHING. Heck, even a cookie reduces my mom-guilt. Frozen Waffles are great in a pinch! I'm not usually in a hurry to eat breakfast--however, if I need to grab something on the run, I love the Nutri-Grain superfruit fusion--cherry pomegranate bars! My go to breakfast is toasted bagel with cream cheese! Yum! I do love Kellogg's Special K with strawberries, so sometimes I have that! I did as a kid and miss em. Horribly. My quick breakfast is oatmeal. I usually bring a packet into work every morning. Bananas and yogurt are our go to breakfast foods when we are rushed! Toast is a good one. It's fast and easy and you can take it on the run! When I am in a hurry for Breakfast I eat a cup of Vanilla Yogurt and or a Banana. Throw together a bowl of instant oatmeal and grab a banana. I grab a cereal bar and a thermos of milk. We do cereal in baggies to eat while we are driving to school. I can eat a breakfast bar, got to be a chocolate chip of some kind and a cup of coffee. Dry cereal in a baggie. I never said I was high class! A bowl of cereal and a bottle of water. I insist we take the ten minutes to at least do that, every morning. my go to breakfast is apple & string cheese- milk for kids- coffee for me! Toast and orange juice is always a quick fix around here! Dry cereal or fruit and toast!